Belgrade is one of Eastern Europe’s clubbing meccas, an early adopter to acid house and as any who have passed through it recently can attest, is fizzing with energy. For the next in our series of features where local experts tell us about their scenes, three of the city’s main players, promoter Igor ‘Pookie’ Puljic, local raver Milos Tomin and TV music journalist Katja Radojkovic pool their thoughts to tell us what’s happening on the Serbian capital’s buzzing club circuit. Ibiza Voice: Can you start by telling us some history of the scene in Belgrade? Puljic/Tomin/Radojkovic: Even though it was a capital of a former communist country Yugoslavia, Belgrade’s night life has always been alive. Despite the wars and complex economic situation of the past few decades, the city’s club scene never suffered as much as one could have expected and has always been up to date with western trends. The first proper DJ club in Belgrade with decks was opened in the early sixties by music lovers and enthusiasts Lazar Secer, the host, and Sava Radosavljevic, the DJ. Over the following decades there were lots of clubs and a few milestones that would change the history of Belgrade clubbing forever. Sava Radosavljevic, wondering when someone’s going to invent Discogs. The student run, Akademija, was one of the first clubs in Europe to throw acid house parties in the late 80s. Soul Food Cafe was the first acid jazz and house club in the region, while Bosko Buha was the first dedicated house club to play nothing but electronic beats for three nights a week from 1989 onwards. 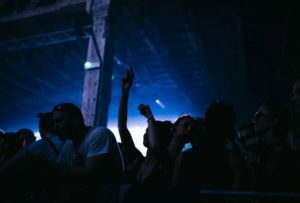 The most significant influence on Belgrade’s techno, trance and house scene was made by Industrija, which started in 1994 and lasted for seven years. Lost in the moment at Baratuna. How is the scene now in the city now? The club scene has never stopped expanding since the early 90s. Minimal, tech house and techno are the strongest club genres for the last two decades. Somehow particular sounds like big room trance or EDM never got too big in Serbia probably because of the local DJ’s particular tastes in music. What are the main clubs these days? 20/44 is the only Belgrade club to be featured in the New York Times on three separate occasions. Its music policy is eclectic but mostly nu disco, house and techno. It is a riverboat and 100% underground in nature. Internationally renowned DJs TijanaT and Vladimir Ivkovic hold monthly residencies there, alongside the legendary DJ Brka. Drugstore is a former industrial butchery and Belgrade’s answer to all things Berlin. The style here caters to younger crowds raised on Len Faki style techno sounds. Home favorites Dejan Milicevic and Marko Milosavljevic are regulars. The venue that used to be home to Soul Food Cafe is now a small underground club called DOT. It’s musically house, tech house, techno oriented with some new local and foreign talents, as well as some old school players every once in a while. See some of the newcomers here before you read about them online! Barutana is an open air club operating during summertime, inside the 14th century Fortress of Kalemegdan. It’s a unique environment with an early summer sunrise that has made so many memories for its visitors over the years. John Digweed, Paco Osuna, Monika Kruse, Chris Liebing, Yousef, Nic Fanciulli, Patrice Baumel have all recently played. The Soul Food Cafe cloak room back in the day. Maximum 90s acid jazz points to the guy in the Talkin’ Loud tee. What’s your favourite after party and why? Mint started as an annex to its sister, club Plastic and has been operating as an after hours club for much longer than some sadly missed clubs of yesteryear. It is good but has been operating sporadically as of late. Marko Nastic left an indelible mark on the scene throughout the 90s as part of Teenage Techno Punks duo with Dejan Milicevic. He has recently partnered with Pero Di Reda, of The Tube fame, who currently operates Sloboda, a summer chillout detox spot. The pair run the (literally) underground room of the Savamala clubbing complex Mladost-Ludost-Gadost-Gajba. Gadost often runs past 7 AM. Radost is part of the same compound in SavaMala and is probably the best place to eat a proper pizza and a nice steak at 4am. Local techno star Marko Nastic. Last but not least, KPTM, adjacent to Port of Belgrade, and Hangar, are for dedicated club heads only. If you want a taste of anything-goes Serbian clubbing from 20 years ago, this is the place for you. Highly recommended. Who are the main players in the Belgrade scene today? The pioneers of the club scene in Belgrade are still active and in charge of the majority of party brands in town. Of course, there are always some new kids trying to find their place in the sun too. In recent years, Blender has brought some cool names to Serbia for the first time, as well as some old school heroes. Matador, Nicole Moudaber, Paul Kalkbrenner, Stephan Bodzin, KiNK, Kollektiv Turmstrasse, Black Coffee, Hito, John Digweed and Hernan Cattaneo have all played recently. Apgrade is run by Belgrade club pioneers Vlada Janjic and Gordan Paunovic, who been promoting underground electronic music for the past two decades. Their concept is based on the German techno sound and they have brought over Sven Väth, Richie Hawtin, Dixon, Loco Dice and many more. Raveolution and Play are relatively new to Belgrade’s club scene and mainly focus on tech house and techno sounds, booking names like Oxia, Art Department, Sam Paganini, or Mind Against. What’s the best Belgrade festival? The festival scene in Serbia started in the early 2000s after an unpleasant decade of wars and sanctions. Belgrade doesn’t have a major music festival with a huge capacity, but there are some cool boutique parties. Belgrade Beer Fest is more a gathering place, than a music event. It’s the biggest open air event in the region with 500,000 visitors in five nights for the last 15 years. Even though it hosts mostly regional acts when it comes to music, they have also hosted DJ legends like Pete Tong, Felix Da Housecat, Darren Emerson, Timo Maas, Roger Sanchez, Kevin Saunderson, Mark Knight and many more. Entrance is free and definitely worth checking if you are a Beer person. Exit Festival doesn’t need any introduction. It’s not in Belgrade, but is very close and has won several awards. Lovefest is also outside Belgrade. If you happen to be in Serbia in the first week of August, that is the place to be. Apgrade has its own mini festival held on the first weekend in September, in Belgrade. Let’s Mix It is held on the first weekend in March and is the latest in the crop of new Belgrade mini-festivals, and is notable for being the only winter time party. What’s the city’s coolest area to hang out and why? Savamala is unavoidable where clubbing is concerned. Trendy, popular with locals and foreigners alike, it’s packed with clubs, DJ bars and places to eat. Most places stay open very late. Recommendations include aforementioned Mladost Radost Gadost Ludost Gajba and KC Grad. Another key party district is centred around Cetinjska Street. It also has a great number of small bars, clubs and restaurants. As it’s in a residential area, its nighttime spots aren’t open as late as those in SavaMala. What’s the city’s best record shop? Until the mid-90s Belgrade didn’t have any dance music record shops. Due to wars and sanctions, it was impossible to import any vinyl to Serbia. DJs had to travel abroad in order to get records, or gave shopping lists to their friends somewhere around the globe. When that changed, HMK Music and LNP shops provided the underground electronic sounds to Belgrade DJs. Nowadays, vinyl shops that are working well and worth checking out for the diggers looking to find a bargain bin gem are Leila, Yugovinyl and Metropolis Record stores. Working up an appetite at afterhours spot, Mint. Best brunch place to hang out when you’re hungover? For the past few years premium coffee shop culture has boomed in Belgrade. After a great night out, the places to take a perfect cup of coffee are Koffein and Przionica. There are also few very cool breakfast places like Infuzija, Tezga and Radionica, with some domestic specialties on the menu. In most places, value for money for food is great compared to similar places in other parts of Europe. If you need direction on the streets or anything else, don’t be afraid to ask the locals. Most of them speak very good English and even if they don’t, will be more than willing to help you out. If you exchange more than a few sentences with them, don’t get surprised if they invite you for a drink! Igor Puljic Pookie is one of Serbia’s DJ and promoter pioneers and has brought more than 250 DJs and 50 live Acts to the Balkans in his career. As a DJ he’s also part of IDQ project with releases for Yousef, Roger Sanchez, Sandy Rivera, David Penn and The Shapeshifters. Katja Radojkovic is a passionate music lover who was hosted her own TV show about clubbing and electronic music in Serbia back in the day. Milos Tomin – aka Duke of Rave – is one of the most dedicated clubbers in Belgrade and has attended probably every party night in Belgrade worth checking out for the last three decades.